The equine stars of The Little Red Riding Book are based on the author's real horses. Percy's registered name is Batalj (Ba-tal-ya), which means "war horse" in Swedish. Although he is king of the herd, he is very gentle and kind. 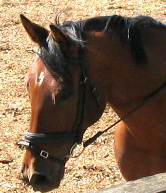 A Swedish Warmblood, he was born in Sweden and trained in dressage. When he was old enough, he travelled by plane to Washington State and taught beginners how to ride at a riding school. A few years later, he moved to the Fraser Valley in British Columbia and competed successfully in dressage. When Percy and Jonathan met, it was clear that Percy was doing the training and Jonathan was just along for the ride! Playful, forgiving, and easy tempered with charisma is a nutshell description of this wonderful horse. Amaretta, named for her glistening copper-bay coat, is an andalusian/thoroughbred cross. She was bred by Jim and Anne-Marie Reed of Reed's Andalusians, who at the time lived in Edmonton, Alberta. She moved with the Reeds to British Columbia where she was sold. She went through several owners and ended up with a horse broker who only managed to break any trust she had in people. The Reeds found her and gratefully bought her back, giving her a stable home after several years of unrest. She joined the Boudin family, becoming Jonathan's first horse. Through perseverance, patience, trust and learning, Amaretta is not only a happy horse but has been a star in the show arena. She can, at times, still be a handful for adult riders, but when a child is on her back she becomes a gentle baby-sitter. Much to the envy of the adults!